Watch a triumphant speech after a sports championship or business milestone and you’ll almost always hear some variation of this catchphrase: “It couldn’t have happened without the great team we have.” It doesn’t matter if you’re the owner of a 10,000-employee Fortune 500 company or running a small business, you’re a part of a team. With a combined 50 years of experience building, managing, advising, and troubleshooting teams in both the business and sports worlds, Jason Selk and Tom Bartow now reveal the common DNA that links the highest performing teams. 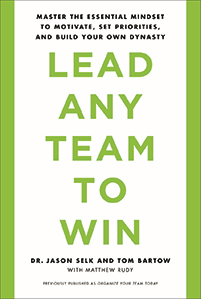 In Organize Your Team Today, Selk and Bartow show how it takes collective mental toughness to win, developed only through a clear understanding of the goals, limitations, roles and personalities on your team. Great leaders respect and embrace channel capacity, Selk and Bartow explain, which means they don’t overload their teams with blizzards of tasks and responsibilities. They bust the “focus” and “relationship” fallacies, as those words are meaningless for teams unless they are byproducts of activities that really matter. And Selk and Bartow teach how to manage expectations, since doing so creates a level of respect between the leader and the team–and among the team members–that is a catalyst for peak achievement. Shop our online store with complete confidence. All orders are processed safely and securely! Browse our products in the store directory.